If you’d like a brief respite from the ugly world of politics, war and poverty, take a look at this. 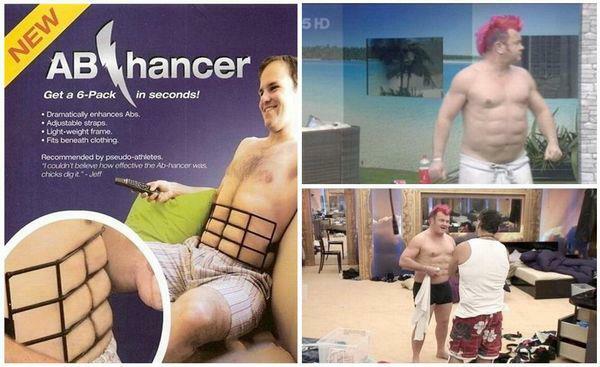 This is the Ab-Hancer. It is a grate you place on your abdomen and it makes a “6 pack” imprint. The greatest thing about this ad is the photo on the right bottom. One might think the advertiser would say, “hey guys, can we clean up the room before the photo shoot?” Nope. Not this quality product placer. They said, “please make sure the room looks as if there was a brawl in there, don’t make the bed and leave all dresser drawers open.” The choice of the red Mohawk for the “model” is also quite priceless. In all, a total win. What’s even more frightening, I bet they’ve sold quite a few.